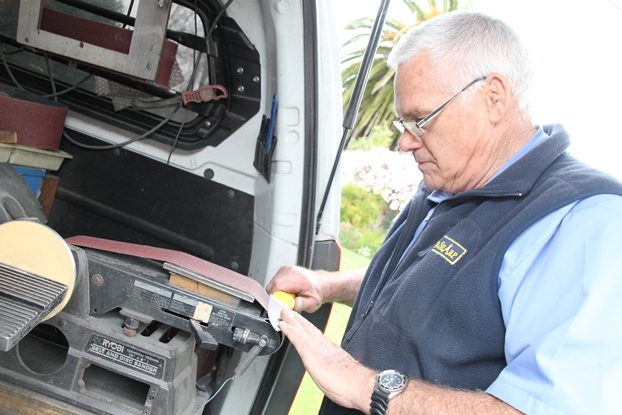 Mr Sharp: Sharpen and Supply provides a mobile professional knife and tool sharpening service covering the Rangitikei - Manawatu Districts. A sharp tool is safer to use, requires less effort to operate and accomplish the task in a shorter time. If you require I will supply you with loan knives while yours are being sharpened. "Wally arrived well presented, punctual, friendly, full of knowledge in his field of expertises and delivered a great, professional service." "Had a gentleman come to sharpen my cutting scissors and I just wanted to tell you that they are absolutely fantastic. So thanks once again." "Thank you so much Wally for the tools which arrived today. You have done an amazing job, they are wonderful!" "They arrived and are fantastic thank you so much Wally you do such a good job. Awesome." Established over 19 years ago, Mr Sharp Services offers an on site professional knife and tool sharpening service to the greater Manawatu,Rangitikei and on occasions Whanganui, Horowhenua, and Tararua areas. Items sharpened include knives, scissors, garden tools, workshop machinery (including saws, both circular and hand - including TCT), chisels, planer blades, chainsaws, hand shears, electric and motorised hedge trimmers in fact just about anything with a cutting edge. Further training some ten years ago permitted the inclusion of sharpening and servicing professional hairdressing scissors, clippers and trimmers (including animal grooming equipment). Annual attendance at overseas sharpening conventions enables maintenance and improvement of that skillset. Copyright © 2019, SHARPY. All Rights Reserved.